There are no refunds; all sales are final. However, if you cancel you can reschedule up to 90 days after original purchase date. Class was amazing, it was the perfect beginner level and we learned some good moves. I really enjoy the Monday Pole 1 class, as well as the Wednesday evening Yoga. Both challenge me and require me to work hard to accomplish a move. Unlike other fitness places my weight is not a barrier. The staff encourages everyone to "love your curves" and work to refine your shapeliness. Literally the best thing I've decided to do! I love the classes, the atomsohere, the people that I've met and more importantly the new body I have! I encourage everyone to check this place out there's something for everyone ... you won't regret it! Divas and dolls fitness center is the absolute best! You will work pounds off by having fun. Dance your way into an old dress or those jeans that you want to get back in. I love the fact that it's a very sisterly environment and everyone is so encouraging!!! This place is a GEM! If you are a lady that loves group fitness you will adore Divas & Dolls. Encouraging, fun and you can't help but make friends with all the awesome ladies that attend. The members are of all ages, which is particularly fun. During my latest visit, a woman who has to be in her late 50's or early 60's gave me pointers on the correct way to twerk my thighs LOL! I must say the traditional gym setting has never worked for me, so it is refreshing to go somewhere and exercise without feeling judged, intimidated, uncomfortable or bored! If you enjoy working out I promise you will be DRENCHED in sweat after spending an hour here. I recommend trying Pole 1 and Zumba with Blair, Twerk & Chair with Krystal and Lap Dance with Jynnifer. The studio has three rooms and also offers Yoga, Kickboxing, intervals training classes and various Pole and Stretch classes. Classes are offered at times that can fit any schedule. I am frequently late due to my work hours, so I also appreciate that there is a 15 minute grace period if you are tardy for the party. In my opinion, another strong suit of Divas & Dolls is that it is the only studio of its kind near my home. 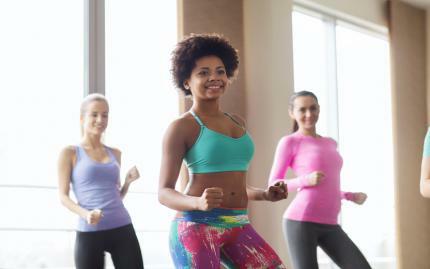 It is the sole dance/fitness studio within a 15-mile radius of my neighborhood that offers all the classes I enjoy taking without having to travel into Virginia or DC. If you are a new client a one-month trial membership is only $50, and it is totally worth it! I lost about 8 lbs and 2 inches off of my waist, so I'm certain the new workout routine has helped me achieve these results (in addition to adopting a healthier diet). Not only am I rebuilding my core and upper body strength, but I've gained confidence as well! I look forward to my classes every week because being fit no longer feels like an unattainable goal! I went to this studio for a pole class for beginners and I loved it. The studio is very clean and the Staff members are very friendly and down to earth. I attended the pole 1 class with Blair and it was sooo fun. She is very confident and fun to work with.The class was full and Blair suggested early registration for future classes. Will be attending multiple classes in the future!! I am an avid poler and I must say I really enjoy this place. They recently relocated and although I never saw the previous location, I am told by other clients that this location is much better. They offer a wide variety of classes including different levels of pole, twerk, yoga, and Zumba and the clients are very diverse. There are multiple rooms for the different classes. The instructors and staff are very friendly and the studio is frequently making improvements. Since I have been attending they've gotten new sounds systems and new merchandise. They also frequently adjust the schedules for customer convenience. I've take classes with Blair, Tara, Markita during the studios annual open house. They all have different teaching styles but the classes are fun and a good workout. Would definitely come again. We did a bachelorette party this weekend and hired Krystal Pillow to do a twerk class for us. She brought speakers and music along with a great time. We did floorwork, twerked on our knees, and on our feet. Everyone had a great time and are planning to try some of the other classes they offer. It was way more of a workout than we expected but that was a pleasant surprise. This was one of the bride's favorite parts of the entire night. Definitely a must do!